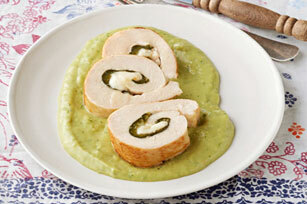 It's hard to say which is tastier in this recipe: the poblano-stuffed chicken or the creamy avocado sauce. Luckily, you're having both! Place chicken, top sides down, on work surface; top with chiles and cheese. Roll up chicken, starting at one short end of each breast; secure with wooden toothpicks. Add chicken to large skillet sprayed with cooking spray; cook on medium-high heat 6 min. or until evenly browned, turning occasionally. Transfer to rimmed baking sheet sprayed with cooking spray. Bake 15 min. or until chicken is done (165ºF). Meanwhile, blend remaining ingredients in blender until smooth. Remove and discard toothpicks from chicken. Slice chicken. Serve with avocado sauce. Serve with your favourite hot steamed vegetable to round out the meal. To pound chicken breasts, veal cutlets or tenderize beef, place meat in a freezer-weight resealable plastic bag, then pound the meat with the side of a heavy can, rolling pin or meat mallet until meat is the desired thickness. The bag will contain the liquids from the meat, minimizing the mess. Heat broiler. Place chiles on foil-covered baking sheet. Broil, 4 inches from heat, 7 to 10 min. or until chiles are evenly blackened, turning occasionally. Place in paper bag; close bag. Let stand 20 min. or until chiles are cooled. Remove chiles from bag. Peel away blackened skins with small knife; discard skins. Cut chiles lengthwise in half; remove and discard seeds. Use roasted chiles as directed in recipe.